Dr. Ujjwal M. Mishra and Mr. Jayant Pawaskar. "A Study of Non-Performing Assets and its Impact on Banking Sector." Journal 4 Research 3.1 (2017): 1-5. Shruti Joshi, Prof. Melba D Souza, Aarti Kumari, Pooja Pai and Saiesh Sangaonkar. "Voice Recognition System." Journal 4 Research 3.1 (2017): 6-9. Manamohan Maharana. "A New approach for Solving Transportation Problem." Journal 4 Research 3.1 (2017): 10-14. S. Ramacharan, A Anusha, D Sravya, G Dharani and M Mamatha Chawan. "Provable Data Processing (PDP) a Model for Client's secured data on cloud." Journal 4 Research 3.1 (2017): 15-19. Sushmita Sharma, Nikhil Patil and Pradip Patil. "Automatic Milk Collection System." Journal 4 Research 3.1 (2017): 20-23. Iresh Ranjan Bhattacharjee. "Gravitation Induced Mechanical Movement in Cells." Journal 4 Research 3.1 (2017): 24-31. Rashmi Keshvani and Prof. Maulik S. Joshi. "Meteorite Shooting as a Diffusion Problem." Journal 4 Research 3.1 (2017): 32-35. Kundan Gunwant More, Amol Kailas Koli and Amol Vikas Joshi. "Experimentation on Copper Tube with Internal Threading for a Heat Exchanger Performance Enhancement." 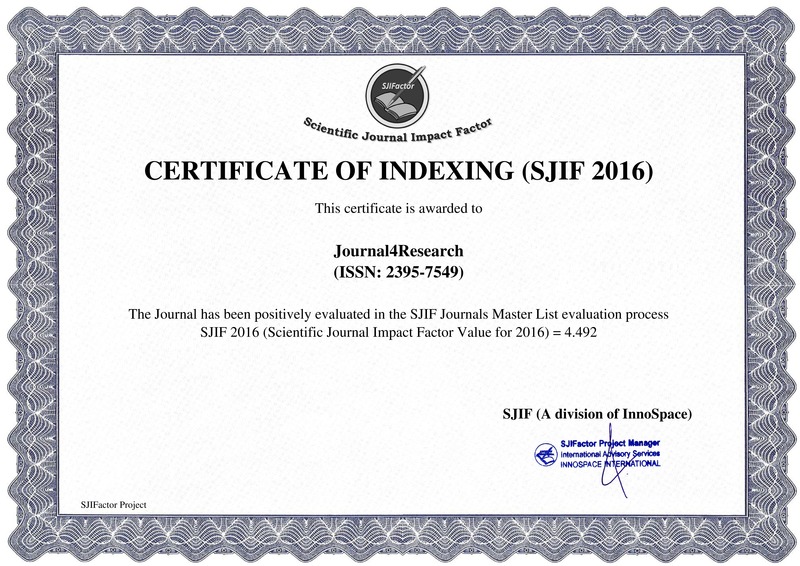 Journal 4 Research 3.1 (2017): 36-40. Manprit Singh and Nirpakash Uppal. "Experimental Study of Chemical Etching on EN8 & EN38." Journal 4 Research 3.1 (2017): 41-46. E.Arun, T.Karthik Prabhu , Dr.K.Mylsamy and A.Guruprasath. "A Review Study on Activated Carbon for Reducing Pollution." Journal 4 Research 3.1 (2017): 47-49.